Bingo! You're a geniuis! Thanks MrC. This is Russty with 2 s's signing off! Thanks for the update here! Glad to hear you've got it working. @MrC, thanks for your help in this matter, as always. Follow that instruction and try the conversion again. Thanks for your prompt reply. still can not. Can you explain which version of ActivePerl you installed, and how and where? Something does not seem right with the installation. 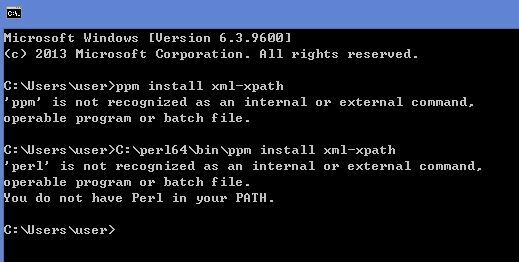 and then run the ppm command to instal xml-xpath. But now got another problem, after import on desktop, when i sync with dropbox to iphone6, 1password on iphone6 crash, and can not launch now. Finally, it works. Thanks very much. Geniuis! Great, so that's good progress. Thanks for the nice feedback. So that I'm clear, your import into 1Password for Windows was successful and seemed correct (the number of records looks correct, a quick glance at the data seems fine, etc.)? If that's the case, then it think your issue is a separate matter, having to do with syncing 1Password for Windows with Dropbox, and then getting that data into the iPhone. I recall that records can take a little while to propagate to and from Dropbox the first time. You should post your issue in perhaps the IOS or Windows forum, and the AgileBits folks can work with you on that matter. I've exported my SafeWallet data to xml and tried to import it via your conversion utility. However, I'm getting 'Imported 0 cards'. Investigating further, it appears that I'm running version 3.0.5 whilst I believe your conversion utility is for 3.0.7. I assume that there's been a slight change to the xml format that's causing the issue. Would it be possible to send me a dummy SafeWallet 3.0.7 xml file so I can check what's different and then correct my version? Your theory of format changes makes sense and is possible. If you send me an email, I'll send you my test data file created with SafeWallet 3.0.7 on Windows. If there are format changes, I'll need to get an idea of how that formatting has changed, so might have to ask you for an XML export of some dummy data to review what has changed and make any modifications to the converter module. My email address is at the top of the converter script. Edit: it turns out the issue was not due to any substantive XML export differences between the 3.0.5 vs. 3.0.7 versions. The issue was that the data format in the SafeWallet 3.x series changed from the 2.x series. Version 1.01 of the conversion suite handles these changes (it is in the _testing directory of my AgileBits Utilities folder - see link in post #1). Just to confirm that V1.01 handles the XML export from the Windows version of SafeWallet without any issues. All my cards are now safely migrated to 1Password. Does this work with UTF-8 charset? I am converting safewallet 3.0.7 export file and many card names are in UTF-8, asian characters. 1password work well with manually typed UTF-8 entries. I opened resulting 1pif file and confirmed it seems OK. no corrupted entries. I guess 1password is the one corrupting them while import. Sorry for the false alarm. The "secureContents" part of the resulting 1pif file is very much different from one 1pif I exported from 1password after manually typed in some cards. the converted 1pif has all the information in "notesPlain". I guess my safewallet cards are too heavily customized to be converted. They were imported into Safewallet from SPBwallet. 1password import/export cannot handle UTF-8. I manually inputted 10 cards with UTF-8 titles, export 10 of them in 1pif, created a new vault, imported that 1pif file, resulting a mess. 1PIF handles UTF-8 just fine. And the required version of Perl handles Unicode fine too. The SafeWallet converter, however, currently only supports English field names simply because I do not have the translations for other languages. Since field names are matched (using pattern recognition), only those that are coded into the card type and field name table are recognized (another converter uses translation tables to handle localization, but I don't have access to those for SafeWallet). Unfortunately, my SafeWallet demo has now expired, and there is no way to register or extend the trial, so I can't quickly go test Asian characters. However, my test data does include Unicode values and those were properly handled and encoded into the 1PIF, whereby they were imported into 1Password. I'm not sure what is going wrong in your situation. If you can create for me a test data file for SafeWallet, using the stock English field names, and including Asian characters in the values (or in custom fields), I can test out what might be going wrong. I have no idea what the SPBWallet --> SafeWallet conversion did, so can't really comment on that aspect. If I had the translation tables, I could automate this (as it is done in the mSecure converter). It's a little more complicated, possibly, than this, since the uniqueness of these string values across all the cards dictates whether or not a card category can be safely assumed. If you want to discuss how your conversion might be handled, let's talk offline. I'll need a sample export (not your private data), and I'd need you to provide a translation table for your language (I'll explain what's required). My email address is at the top of the script. any ideas where i should look ? Can you tell me about your eWallet's version and platform? Is it possible you were running eWallet on Windows, and exported it there, and then moved the export file to a Mac to convert? Can you tell me about your eWallet's version and platform? yes this is exactly what i did. what do you think is the problem ? Great, that's what I thought. You'll have to export and convert on the same platform. Please follow the Windows instructions and see how you fare. But I'm still getting the following error message. What is the failure? defined. It was interpreted as a "" or a 0, but maybe it was a mistake. Since you are customizing the converter, let's discuss this offline. Send me an email and I'll follow-up (my email is at the top of the script). I don't see, nor would expect to see, the error you get by the simple customization you've indicated above. The error would indicate that perhaps additional customizations have been done to the Web-login category, or there is some other factor I can't deduce from the the output above. In case it helps, the error means that the expected Notes part of the Web-login is missing, and that should never be the case (it could be empty, but not missing from the cell data). Also, you don't need to specify the type_out => 'login' since the specific card_field_spec category is already 'login'. @MrC‌ worked like a charm. Thanks for your hard work on this! You're welcome! Thanks for the nice feedback. Out of curiosity, from whence did your data come? I found the problem. mSecure is exporting my csv file with semicolon instead of comma. My PC has German as primary language and that's why it is using a semicolon for csv files. I just had to change the region and language settings to English. I have no idea how well mSecure exports using this character, so your choice to change the region settings was probably your best and safest bet. It sounds like you are good to go. This has been mentioned in other posts. Whilst the URL field is successfully updated, the Location field is empty. The location field appears to be used as the domain to match a Login entry to a website, as well as form the search key for Watchtower Security Audits. A successful workaround was to simply open and close each Login record to refresh the Location field. There did not seem to be any need to actively Save the record and I only had to use the Return Key (open/close) and arrow key (up/down) to achieve this. This has been mentioned in other posts. The problem is that 1Password thinks imported logins were created on the date of import and therefore after affected websites have been patched. A successful workaround is to set the system date to sometime in the past (e.g. 1st Jan 2001) before importing into 1Password, and once the import has completed set it back to the correct date and time. Hey Presto - all passwords have an old created date and will trigger a security audit flag notifying you to change your password. Great, and thanks so much for the feedback and helpful tips!. It's nice to hear you were able to import successfully. In sure the AgileBits folks well address the 1Password for Windows issues you mention as soon as they are able. First of all hello to all and thank you for the great tool! Now, I'm partially through the convertion process from LastPass, but the problem is I lost "URL" column when converting the LastPass csv file. I run Windows 7 64bit with 1Password 4.1.0.530 in demo mode and LastPass for Chrome 3.1.69. When exporting, the current LastPass generates the html page with all the data that I copy-paste to the notepad. Can it damage the data structure and cause the problem? It sounds like the issue you have encountered is issue #1 mentioned by @seanspicer above. Does the description makes sense to you and seem to be the same as described? Please also be sure to try version 1.01 in the _testing folder of my AgileBits Utilities share (link at the top of this thread).